Edna was just three years old when her father died in 1888. 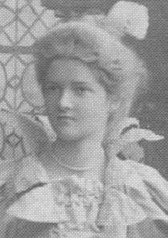 She was attractive, intelligent, scholarly and musical, but suffered from the family predisposition to mental illness, which was also evident in varying degrees of debilitation in her father, mother and brother Calvin. However, her mother, Mary, had very productive periods between the occasional bouts of "nervous prostration," as it was named in the Victorian Age. Edna attended Central Public School in Hamilton, Ontario. In August 1904 Edna won the Governor-General's scholarship to study Classics at Queen's University (W5297, W5307). Her mother's matriarchal efforts were evident in the claiming of this scholarship.Mary was incensed that the award was first given to another student who was less proficient in the Classics. She promptly wrote a letter of protest to the governing body and the scholarship was subsequently awarded to Edna (W5297). It is tragic that even though Mary was happy to be able to secure the award for Edna, she also acknowledged that Edna was likely incapable of finishing even one year at Queen's University. She hoped that if Edna rested for a year she might go to Queen's, but by September and October of 1905, Edna was again mentally ill with "hysterics" and required a doctor and a night nurse (W5398, W5406, W5418, W5422, W5426, W5430). Edna was very talented in music and art and attempted for a time to give private lessons in piano but was never able to continue this as a career. There are many references in the letters to the family's nervous problems, and Edna's condition is described from its initial nervous complaint, through the lucid and productive periods, to the actual breakdowns and hysterical behaviour. The family was greatly concerned about Edna and about the stigma of mental disease, and she was kept at home for many years although the family agreed not to mention her name publicly unless her name was specifically mentioned (W5430). In many ways, Edna is the "madwoman in the attic" of the Whitehern story. She created a great deal of anxiety in the family, but they took loving care of her and made allowances for her eccentricities. She was admitted several times for treatment at the Homewood Sanatorium in Guelph. In 1920 she was placed there permanently, where she likely underwent the treatments of the day, which may have included shock treatments, a hysterectomy to counteract the "hysterics," and a lobotomy. In time Edna grew very docile; however, we have been unable to locate the records of her treatment. Edna died at Guelph at the age of fifty in 1935, just one year after her mother's death. She is buried in the family plot in the Hamilton Cemetery. NOTE on the family's mental illness: What is not known about the family's mental history is the effect of the many medications that they took even as young children, or that their mothers took during pregnancy, such as, chlorodyne, paregoric and calomel, preparations containing opium, laudanum, morphine, belladonna, mercury, and others, often in large doses and all prepared with an alcohol base of as much as 30 to 50%.